Like many refugees from Burma in Buffalo—an American city in western New York state—Htay Beh used to leave her sparsely furnished Riverside home and head to the Niagara River to catch dinner: fish that, eaten in large quantities, may cause cancer. Aung Kaung Myat, who lives a few blocks away in a nicely furnished home with leather sofas and an aquarium, used to head to Buffalo’s waterfront for a different reason. He liked to speed around Lake Erie on his motorboat, one of the rewards of working hard, marrying right and starting a business. Both Htay Beh and Aung Kaung Myat come from the same long-troubled country in Southeast Asia, and while they have little else in common, their stories reflect what the numbers show. Refugees from Burma and elsewhere are making Buffalo both poorer and richer. Driven from home by political violence, refugees arrive with nothing but what they can carry. Not surprisingly, then, census estimates show that Asians—a fast-growing group that includes thousands of refugees from Burma—are among Buffalo’s poorest people. Because most don’t speak English, they work in low-wage jobs that make them eligible for Medicaid and food stamps. And as a result, the cost of social services to support refugees from around the world has grown nearly tenfold in Erie County in 10 years. The state and federal governments pay most of the cost, but Erie County taxpayers paid US$7.4 million for welfare and Medicaid for refugees in 2015. That averages $8.02 for every person living in the county. But that’s not just a tax bill. It’s a long-term investment in a bigger, better Buffalo. Over their lifetime, refugees pay more in taxes than the government pays out to support them, said Paul Hagstrom, a Hamilton College economist who did a study showing that a refugee influx in Utica boosted that long-beleaguered city’s economy. Buffalo’s investment in refugees is already starting to pay off, too. “You only have to go to Grant Street to see what they have brought to the city,” said Karen M. Andolino Scott, executive director of Journey’s End, one of the city’s refugee resettlement agencies. On Grant Street, a down-and-out stretch a decade ago, refugee businesses like Aung Kaung Myat’s iT Garden have filled long-vacant storefronts. On the far West Side and in Black Rock/Riverside—the main refugee neighborhoods—job creation and the rate of business starts exceed the county average. Meantime, Erie County’s population has stabilized, and federal figures show it is because of the arrival of more than 12,000 immigrants—most of them refugees—just since the 2010 census. That’s hugely important, said Peter Rogerson, a professor of geography at the University at Buffalo. If the local population is stable or growing, young Buffalo natives will be more likely to believe they have a future here, too. If those young Buffalonians stay, they will be part of a fast-changing city. The Census Bureau estimates that 12,822 Asians lived in the city last year—nearly double from five years earlier. Many of those newcomers are refugees from Burma, and the vast majority live a lot like Htay Beh. Htay Beh’s home tells her story. The flowered wallpaper in the kitchen—now turned yellow with age—looks like it dates from the 1930s, save for the torn part that’s patched with tinfoil. The refrigerator door handles are missing. Her living room is mostly empty except for a few hand-me-down patio chairs, a Kmart utility table and a shrine to Jesus near the TV. In the corner near the door, there is a small monitor, part of a security system designed to keep what’s hers hers in a changing neighborhood where burglars lurk. A plump, round-faced woman of 40, Htay Beh came to Buffalo with her family nine years ago from a refugee camp in Thailand. And ever since, she has tended to her husband and six children, who now range in age from 6 to 17. For Htay Beh, tending to the family means picking out the family wardrobe at the Baby and Children’s Ministry on Jefferson Avenue. It means taking a summer job in the farms of Eden so her husband can afford the plane ticket to visit his ill brother in Thailand. And it means turning the backyard into a garden lush with corn, cucumbers and exotic leafy vegetables. This is the life of Buffalo’s new working poor: its refugees. Of the 100 refugees interviewed for this series, many recounted struggles like those Htay Beh described. Like most refugees from Burma, neither she nor her husband speaks English. They said they are too busy working to learn it, and they are not alone. In fact, a recent Census Bureau estimate shows about two-thirds of the city’s Asians speak English less than well. That leaves many working low-skill, low-wage jobs. This spring, Htay Beh took a full-time job at MTS Sewing in West Seneca, earning $9 an hour. Her husband earns $12.15 an hour washing dishes at a restaurant in Hamburg. The family has struggled for years just to put food on the table. That is why Htay Beh used to go to Unity Island, a patch of land in the Niagara River once called Squaw Island. Dozens of refugees gather there on nice summer evenings. At the water’s edge, men and women of all ages fish for their meals. “I’m not sure what is in the water, but the fish tastes great,” Htay Beh said last year. What is in the water is the toxic legacy of Buffalo’s industrial past. That is why the state set strict recommendations on the amount of fish people should eat from the Niagara River. Htay Beh used to feed her family fish from the PCB-laden river twice a week, which far exceeds the state’s recommendations. Told about the state’s warnings, Htay Beh stopped fishing in the river. She said that since she started working full-time, she didn’t have time to fish. Multiply Htay Beh’s story by a few thousand, and you get a sense of the short-term financial impact this refugee wave has had on Buffalo. These are not immigrants like the ones who come to America for medical school, or even those who leave their homes in Mexico for seasonal farm work. Refugees flee their home country with just the basics and typically acquire few more possessions in their next makeshift home, be it a refugee camp or an urban slum. Htay Beh remembers coming to America with just a few blouses and longyis—long, often colorful wraps that are popular in Burma. Aung Kaung Myat had two shirts, two pairs of jeans and one pair of shoes. In arriving so poor, they were hardly unusual. Last year, almost half of the city’s Asians—many of them refugees—lived in poverty, the US Census Bureau’s American Community Survey estimated. Nearly 14,000 refugees from around the world settled in Buffalo in the past 15 years, and thousands more moved to the city after first settling somewhere else. And since so many are poor, 7,171 refugees in Erie County were on welfare at some point last year. Some 9,888 enrolled in Medicaid, and 12,635 received food stamps. The federal government pays all the social services costs for the first eight months after a refugee arrives, but after that, the federal government and the state share the costs for food stamps. And after those first eight months, the state and federal governments pay about 90 percent of Medicaid and welfare costs, with the county picking up the rest. That means Erie County now pays 10 times more for refugee social services than it did a decade ago. That’s a matter of concern to Joseph Lorigo, majority leader of the Erie County Legislature. Erie County Executive Mark C. Poloncarz disagreed. “The long-term gain is so great that it justifies the short-term expense,” said Poloncarz, a Democrat. Academic research indicates that refugees do eventually bring economic benefits to the cities where they settle. For example, a Fiscal Policy Institute study of refugees from Burma nationwide found that those who had been in the United States less than 10 years earned about $19,000 annually. Those who had been here more than a decade earned $39,000, which is almost a third more than the typical immigrant who had been here that long. Similarly, a study of refugees who arrived in the 1970s, conducted by Kalena Cortes, a Texas A&M economist, found refugees earn more than other immigrants and bring more value to their communities than it costs to resettle them. It takes time, though, for that payoff to occur. The study of Utica’s refugee community by Hagstrom, the Hamilton College economist, found that refugees become a net economic benefit in their 15th year after arrival. And they don’t end up paying off the community’s investment in them until year 23. Eventually, many refugees thrive in America, and economists say it is because they work so hard. Many refugees interviewed for this series said they worked not one job, but two, and several employers praised the refugees’ work ethic. For about 50 hours a week, a cherubic young man wearing thick-rimmed Prada glasses and a patch of whiskers on his chin stands behind the counter of a storefront on Grant Street. Meet Aung Kaung Myat, 29, owner of iT Garden. 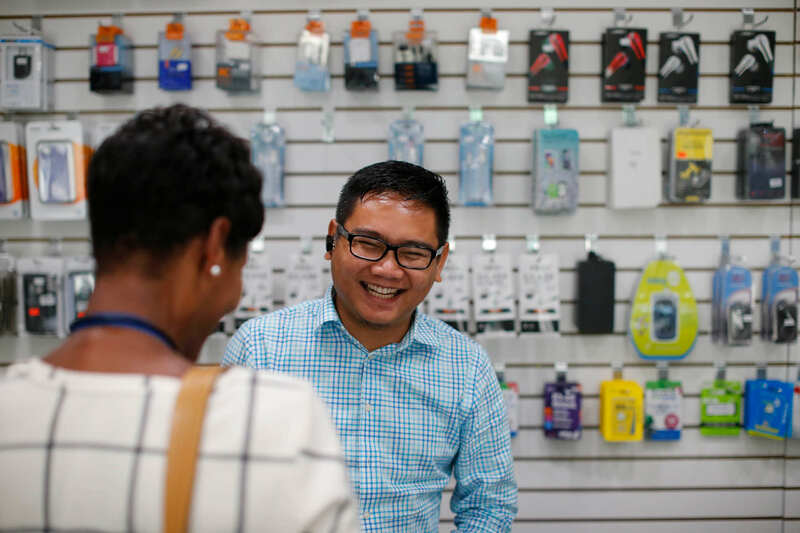 Day after day, he stands there, serving immigrants in search of cellphone deals and iPad and computer repairs. Aung Kaung Myat arrived in Buffalo in 2008 and quickly worked his way up from McDonald’s to a factory job to running his own business. To hear him tell it, he moved so far so fast because of a decision he made as a young refugee studying in Mae Sot, Thailand. Armed with that skill, Aung Kaung Myat and his friend Mustafa Abdo, a Somali refugee, opened their own business in the summer of 2013, But that’s not the reason Aung Kaung Myat owns a nicely appointed home. For that he credits his wife, So Nia, who works long hours as a teacher’s aide and at a data processing center, not to mention keeping the books at iT Garden. “Everything we have is because she knows how to manage the money,” he said. For his part, Aung Kaung Myat knows how to manage the store. He graduated with an IT security degree from Erie Community College, where he met Abdo, and then took an entrepreneurship course and immersed himself in videos about customer service. He then built a business on the fact that so many refugees know him, given the time he’s spent interpreting for and otherwise helping refugees who don’t know English. Still, he has his indulgences. There was that boat and a motorcycle and an occasional vacation like the one to Florida last year where he and his buddies rented a Lamborghini just for the hell of it. In other words, Aung Kaung Myat has seen the American dream, and embraced it. Somebody tried, though, on the Fourth of July 2015, smashing the glass door at iT Garden and stealing everything inside, all $15,000 of it. Security camera images showed a drag queen did the deed. Two weeks later, burglars returned twice in one night, grabbing $6,000 of loot. Aung Kaung Myat grumbled mightily about the slow police response to the burglaries, but the thieves didn’t slow him down. He just moved his store down the street to a safer spot. Best of all, he landed a contract to sell computers to a local college, so business is getting better, which means Aung Kaung Myat is getting busier. He said he’s so busy now, in fact, that he sold his boat because he had no time to use it. Aung Kaung Myat may be an atypical refugee, but not an atypical refugee businessman. Kevin Lin went from sushi chef to owner of the popular Sun Restaurants. Khin Maung Soe, who came here penniless in 2008, now owns two grocery stores and the Lin Restaurant. He is one of several grocers from Burma. Meanwhile, refugees from Burma run the Hill Tribe cab company, the Thaw Thaw Beauty Salon, L&K Auto Repair, and several eateries and shops at the West Side Bazaar. And it’s producing a bit of a boomlet on Buffalo’s West Side. Census Bureau figures show the number of jobs on the West Side and Black Rock/Riverside—where most of the refugees have settled—grew 10.1 percent between 2009 and 2015. That’s nearly three times the countywide rate. Meanwhile, the number of businesses in refugee neighborhoods grew 3.3 percent, compared to 0.9 percent across the county. It happened because the refugee influx has been so intense. What’s more, refugees have bought houses, as have investors who know there’s more demand for housing in the refugee neighborhoods now. The result: housing prices on the West Side nearly doubled in six years, according to ATTOM Data Solutions, parent of the RealtyTrac real estate research service. Meantime, housing prices went up nearly a third in Black Rock/Riverside. A host of programs over the years have helped refugees buy their first home, said Khaing Moe Naing, one of the city’s first refugee real estate agents. He explained how it can be that, only a few years after coming here penniless, some refugees save enough to start a business or buy a home. The refugee wave is changing Buffalo in ways that economic statistics can’t measure, too. Every day, refugees from Burma crowd the West Side Bazaar, the WASH Project laundromat and the Lin Restaurant. 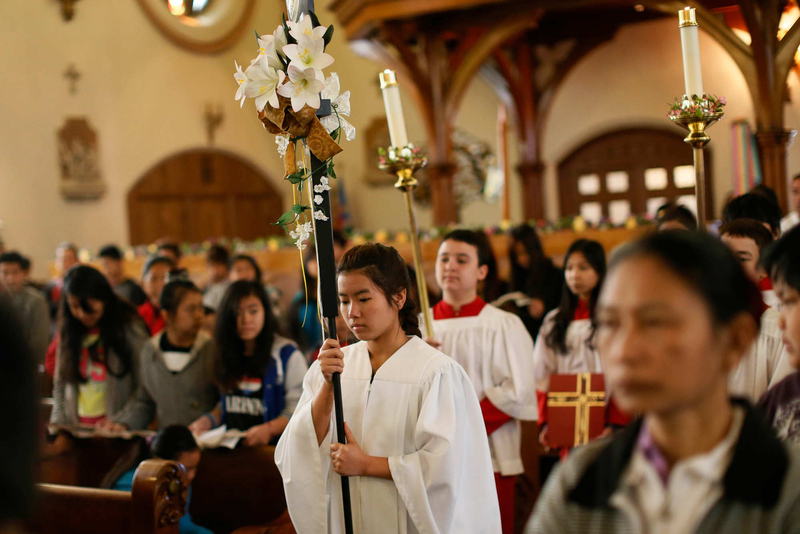 Every Sunday, Our Lady of Hope Catholic Church, once a struggling West Side parish, teems with refugee voices singing Sunday hymns—with some of the lyrics in Burmese. And every few weeks, refugees come together at one of the many cultural events that they brought to Buffalo, be it the Burmese Water Festival [Thingyan], Karenni National Day, Chin National Day or the annual Karen wrist-tying ceremony. Htay Beh was there with a thousand others at last year’s wrist-tying, which symbolizes the bonds that unite Burma’s Karen ethnic minority. She wore a white traditional dress, a Karen flag in her hair and a smile from cheek to cheek. Aung Kaung Myat stood beside the stage at the opening ceremonies at City Hall, dressed in a traditional white and blue Karen shirt, looking on as if he was supervising even though he wasn’t. Htay Beh approached him as he mingled in the crowd a bit later, and what happened next may just say a little something about them both, and about the culture they brought to Buffalo. She looked Aung Kaung Myat dead in the eye and spoke to him insistently in a strangely rat-a-tat-tat, sing-song language: Burmese. Aung Kaung Myat replied with a laugh and a shake of the head, but Htay Beh kept talking, insisting. Finally, the baby-faced businessman relented and took some cash from the diminutive lady from Riverside. She wanted to pay her phone bill, they both said later. She didn’t want to take time off work to make a trip to iT Garden, but she didn’t want to be late on a payment, either. This story originally appeared in The Buffalo News.